SPY rose by 0.8% this week, while my account fell 0.5% to its lowest value ever. The loss-floor has fallen to -10.8%. World news: Crown Prince Nayef of Saudi Arabia has died. My pet theory is that this will have a much larger effect on world affairs than the elections in Greece. None of Nayef’s obituaries discuss his position as a kingpin among the world’s crony capitalists. His expected replacement, Prince Salman, is a very different man. Euro news: The lying is nearing a crescendo. The BBC reports that Spain “was given” a bailout. Oh yeah? They got *promises* of a bailout. You can’t eat promises. US news: Next Wednesday, the Federal Reserve will announce its policy for the next two months. Far too many people have written that it is “almost certain” that they will announce a new money-printing program (QE3). I think this is absurd. Printing money now will cause a spike in the price of food, which could start another Arab Spring, which Saudi Arabia cannot afford during their line-of-succession difficulties. Hopefully the Fed will put this off until August, which will cause large numbers of traders to be sorely disappointed next week. New this week: the daily-gains table no longer has a “Final Gain” column. Instead, when a security is sold, its daily gain is red for one day and then freezes for three days until the trade settles and the size goes to 0%. RWM: Non-robot trade. Obviously the market is going down, so I might as well bet against it. Sell if QE3 is announced, or hold until the crash (with 5% trailing stop to catch the bottom). RWM is a 1× bear, while TNA is 3× bull, so for now I am net 30% long. My guess is that the market will be down on Monday, up on Tuesday, stable on Wednesday if “Operation Twist 2” is announced, then begin its decline. SRTY ¹: Tuesday's buy-order did not go through because Schwab reformatted their website again. Entered manually. Sell-order didn't work either, so entered manually as well. Adjusted the robot code. SRTY ²: Wednesday's buy-order went through, but not the sell-stop order. Entered manually. More robot code adjustments. TNA: Robot is now working properly again. The robot has lost money for every month of its existence. MarketSniper explains why: in their desperation to avoid the next crash, the central banksters are now intervening in the markets almost continuously, breaking up even the hourly patterns that my robot is looking for. We’ve seen this script before. Remember “Baghdad Bob” announcing that the Yankees have been defeated, while US tanks roll down the street behind him? Increasingly I see the words “end game” being used to describe the Euro situation (and by extension the US situation). The game actually ended about two years ago. Wile E. Coyote is off the cliff, hovering in thin air, refusing to admit that he is actually falling. Eventually he will hit the ground and the illusion will shatter. Hopefully my robot will catch the crash and make lots of money, but as of yet there is no evidence that it will actually work. 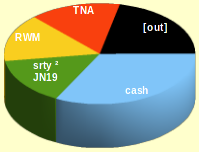 Last year, the TNA and TZA models would have lost money in the first half, then made it all back and more in the second half. We shall see how 2012 turns out.